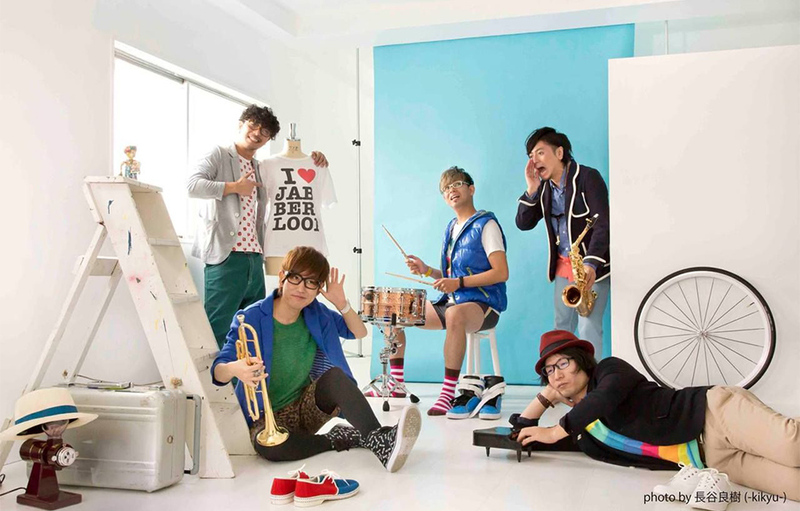 JABBERLOOP, the energetic and charismaticJapanese club jazz band, was born in 2004 in Kyoto, Japan. The band is composed of five members playing the Saxophone, Trumpet, Keyboard, Bassguitar, and Drums.They mainly performed at an average of over 200 street lives a year and sold ten thousands of their independentproduction CDs. One of their music CDs, “UGETSU”, crossed the ocean and caught Mr.Nik Weston’s attention who is the record label owner ofMukatsuku Records. UGETSU was released in London as 12inch EP in May 2007. After being introduced in BBC Radio “WORLDWIDE” by Mr. Gilles Peterson, they made their way into the media world both at home and in abroad. After all these success, they finally made a major debut with their 1st album from “Columbia Music Entertainment Japan” in July 2007. In their debut year, they were awarded a “Japanese club jazz ABLID AWARDS 2007, and recorded first place in Jazz hit chart of Tower Records Japan. In July 2008, they released another CD called ”Infinite Works”. The CD included the music they had worked onfor 1 year after their debut.The CD is a collage of musicdedicated to other famous artists, remixed music, and theirown popular music recorded from their live performances. In March 2009, their second original full album “CHECK THIS OUT! !” was released. They earned the top place in Jazz chart of iTunesStore Japan. In August 2009, they released their Mini Album “ooparts”, and again earned the first place in Jazz chart of Tower Records Japan. In November 2009, their first greatest hits album “REVENGE OF THE SPACE MONSTER” was released in the U.S.A. They also released their first live album,“Live at Motion Blue Yokohama” in Japan. In December 2009, their first overseas live was performed in Taiwan. In October 2010, their third original full album “SEMEMOERU(攻め燃える）” was released and chosen as the best jazz album of the year at iTunesStore Japan. In November 2010, their music “dental driller” was incorporated in the famous TV game of “Winning Eleven 2011″. In December 2010, they released “KEITEN(経典)” which was a collaboration with a popular hip hop artist in Taiwan known as ”SOFT LIPA”. They released deliver E.P. of ”Dear Santa” fromiTunesSotre. They also performed it as a 2011count down live in Taiwan. In March 2011, they played in the theme song of the famous Japanese TV game “Final Fantasy” in the compilation album “More SQ” from Square Enix.